From January 2019, exhibition stand design and build experts Quadrant2Design will be offering their latest innovation, engraved edge-lit graphics, as a special design option. Quadrant2Design exclusively use the Swiss-designed Prestige Events System, a modular and reusable solution to exhibiting, and will be giving all clients the opportunity to add these graphics to their Prestige stand. 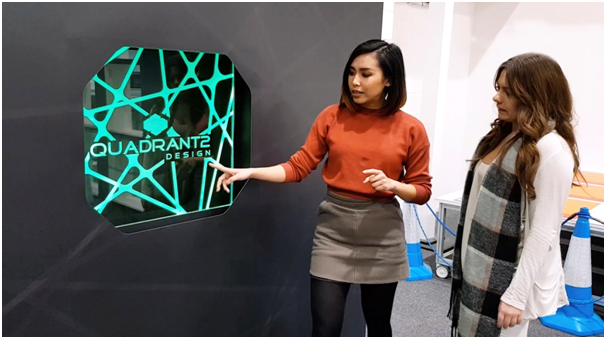 Following the success of their recent advancements in exhibition stand design, including the introduction of their bespoke printed floors and backlit rotating headers, Quadrant2Design are maintaining their status as exhibiting pioneers. Quadrant2Design are delighted to be the first modular stand provider to present engraved edge-lit graphics as a special design option integrated into their offer. Engraved edge-lit graphics are sure to give Prestige stands a bold and eye-catching look, turning heads at any exhibition venue. Made of acrylic, the graphics are intricately engraved with the aid of a state-of-the-art laser cutter, and work by lighting-up the edges of the graphic. The light then passes through the etching, illuminating the design and making your stand show-stopping. Engraved edge-lit graphics are a customisable graphic element which can be integrated into your Prestige stand in multiple ways – including as a stand-alone component, or incorporated into the rear of a showcase to act as a backdrop to your product display. The lighting is colour-changing, and can be programmed to satisfy all your vibrant needs. To see the engraved edge-lit graphics in action, please follow the link: https://vimeo.com/301798972. From January 2019, you’ll be able to complete your Prestige stand with engraved edge-lit graphics. You can contact Quadrant2Design on 0044 (0)1202 723 500 or email designteam@quadrant2design.com to find out more.